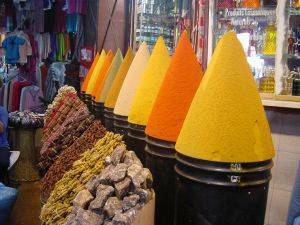 Morocco Food For Kids -Best Food to Try on your Trip! There are plenty of delicious Morocco foods for kids to taste on your family travel to Morocco. Morocco is well known for its delicious tagines, couscous and fresh mint tea. Spices are used extensively in the dishes. Cinnamon, ginger, paprika, parsley and pepper are commonly used. There will be lots of Moroccan restaurants offering the local fare and if you are staying in a riad then you most likely will be able to sample some home cooked dishes there as well. You will of course be able to find restaurants offering international cuisine and the major tourist areas have McDonalds and Pizza Hut. If you are feeling adventurous you can eat at one of the street vendors with the family. Tagines are one of the best Morocco foods for kids to try. This dish is named after the clay pot that it is cooked in. Meat (usually lamb or chicken) is slow cooked with vegetables and spices such as cinnamon, paprika, cumin and ginger. Other ingredients may include olives, raisins, nuts, dates or apples. The result is a delicious stew that your family will enjoy. Harira is a delicious tomato based Moroccan soup. It is made with lentils, chickpeas, onion, rice and herbs. It is usually cooked with a small amount of meat such as chicken, beef or lamb. My daughter loved this Morocco food. Fresh squeezed orange juice is a great treat for the kids to have when traveling to Morocco. You will find vendors offering fresh orange juice as well as fresh tangerine juice. Mint Tea is a common drink in Morocco. Fresh mint leaves are brewed and then sweetened with sugar. My daughter and I loved relaxing each afternoon on the roof terrace of our riad with some mint tea and cookies. Couscous is another one of the delicious Morocco foods for kids to sample. It is small balls of semolina wheat that are steamed (similar to rice). It is often cooked in a broth and served with vegetables and meat. Kaab el Ghzal is a sweet pastry stuffed with almond paste and sprinkled with sugar. Pastilla is another tasty Moroccan food for kids to eat when your are visiting Morocco. This flaky pie is both sweet and savory. It is stuffed with spiced meat (usually chicken though traditionally it is pigeon), toasted almonds, cinnamon and sugar. Grilled Meats are another popular dish in Morocco. Grilled chicken, lamb, beef and fish are served in most restaurants. Kofta is another dish your kids may enjoy. Ground meat (usually lamb or beef) is combined with spices and onion and grilled. Moroccan dates make a delicious snack for the kids. Pick some up in the souk - your kids will love this sweet treat.